Another easy recipe and great for lunchboxes! 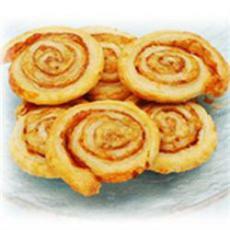 Defrost Puff Pastry. Butter with Pasta sauce. Sprinkle with meat and grated cheese. Roll up and cut into 8 pieces. Cook on greased tray at 190 for around 15-20 minutes.